All of your neighbours wait for the same news. With so many men volunteering from all over New Zealand, whole residential streets felt the effects of war. Most communities were left to live their daily lives, constantly thinking about their young men and waiting for information from overseas. Twenty three of the families that lived on Moray Place in Dunedin sent a son to the war. All eagerly awaited to hear from them. For many of the families it wasn’t good news. Of those twenty three, eleven were killed in action and another nine were wounded or became sick. Only one of the sons of Moray Place came home without visible scars, but the emotional scars would have stayed with him forever. The families on Moray Place would never forget the huge heartbreak the street experienced. William Bollard, an artist, would’ve felt the exact same fear and anticipation as his neighbours, as he waited for the postman or the telegram runner to bring news about his son, John Henry Allen Bollard. John was not among those who returned home to Moray Place. You have been given the map of Moray Place in Dunedin, where John Henry Allen Bollard lived . You are now tasked with discovering more of the story behind John Bollard. How much of his story can you piece together? The suggestions below will help you on your research journey. The How We Find It Fact Sheet will also be a helpful tool in helping you discover the pieces of John's puzzle. You're in luck. John served in the New Zealand Army so his records can to found online at the Auckland War Memorial Museum Cenotaph. This is your most important search. Collect as much information as you can. Once you've found John's Serial Number move to Archway and search for his service documents there. what was moray place like? Everybody knew somebody who was serving at the front. During the war virtually every street had families waiting for news of their sons. Moray Place was and is an iconic Dunedin Street. Using both Google Images and Flickr - can you recreate a set of buildings that would have been in Moray Place between 1900 and 1930? Inspect the Map carefully to see if you can find any clues of what types of buildings were there at the time. Moray Place was listed as the address for the next of kin for 24 soldiers during the First World War. Moray Place was also the location of the Post Office where mail was collected, as well as the Public Library where newspapers were available with news of their loved ones. 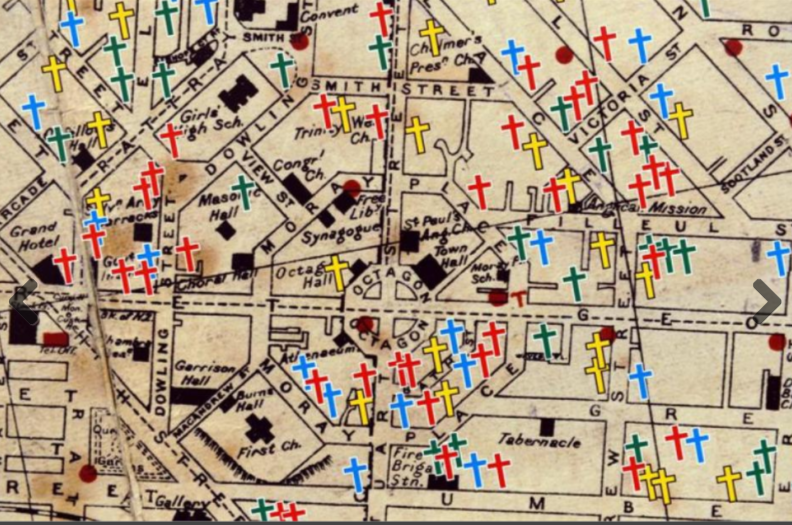 Use a Cenotaph Custom Search and search for 'Moray Place' to find people who had a connection to Moray Place in their service records. Uncover more pieces of John's story. Where else is John Henry Alan Bollard remembered? John's father was the painter William Allen Bollard (use Google to discover what his paintings looked like). Papers Past tells us that he was raised by his aunt in Auckland. He attended Avondale Public School and Kings College. Can you find out if he is remembered on their Rolls of Honour? Use the Auckland war Memorial Cenotaph records that you found in the Custom Search to make a tally of the fate of the soldiers of Moray Place. List addresses to see where neighbours relatives shared the same news. Check your own street or a street near your school or choose a defined time period or battle and repeat the task. A similar piece of research showed the last known address of old boys of Wellington College killed in Belgium and mapped the results. As with the Moray Place, few streets or suburbs were untouched by the fatal consequences of war. Many residents would have known or been related to one or more of these men. The sons of Moray Place is connected with the story of John Henry Allen Bollard who attended Avondale Public School and King's College. The original map is held by Map courtesy of Toitu - Otago Settlers' Museum. It is this project's understanding that John has no surviving relatives. The Walking with an Anzac Team found the first clue in John's story when they visited Avondale School. Further research on the same platforms you have used today allowed us to discover John's Story. Research starting points for John's Story.